with Lori about their enrollment experience. 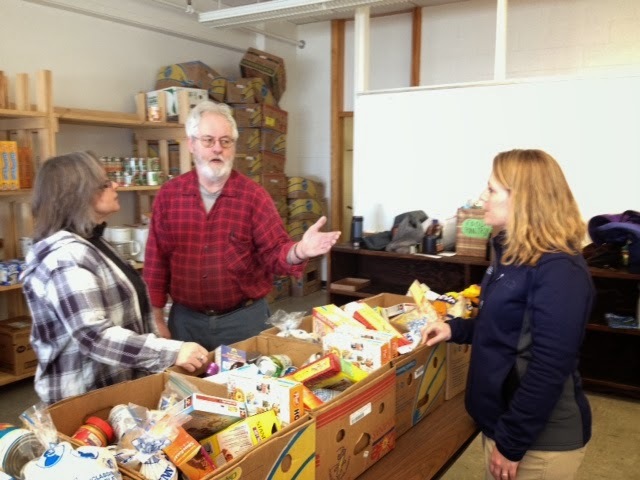 See the article below for more information on how pantries can help consumers with insurance information before the March 31 deadline. Thanks to the Affordable Care Act, many Mainers have a new way to get health coverage through the Health Insurance Marketplace. The Health Insurance Marketplace helps people find health coverage they can afford. People can apply online at HealthCare.gov, by phone at 1-800-318-2596, or with the help of a local assister. Most Mainers can get help paying for a plan on the Marketplace. Financial help is available on a sliding scale, based on how much money you make and how big your household is. For example, a couple in Portland who make $25,000 a year could get a plan for between $0-94 a month. Some parents, children, people with disabilities, and seniors may find out they qualify for MaineCare or CHIP (Children's Health Insurance Program). They should apply for MaineCare using the online portal at My Maine Connection, or by calling our HelpLine at 1-800-965-7476. Nearly 7 out of 10 people do not know that financial help is available. Many have not checked out their options yet because they think they can’t afford insurance. · Share materials at your site. Contact our HelpLine at 1-800-965-7476, and we will send you brochures and flyers. You can also order resources online through Enroll207. · Refer people to our HelpLine at 1-800-965-7476 for help. We can help people understand their options and how to apply. Remember, people who don’t have insurance in 2014 may have to pay a penalty, unless they qualify for an exemption! The deadline to sign up is approaching quickly: March 31, 2014!